1. Place the broccoli, onion, carrot, and garlic in the bottom of a large crockpot. Pour chicken stock over the veggies. Add the nutmeg, salt, and pepper and stir. 2. 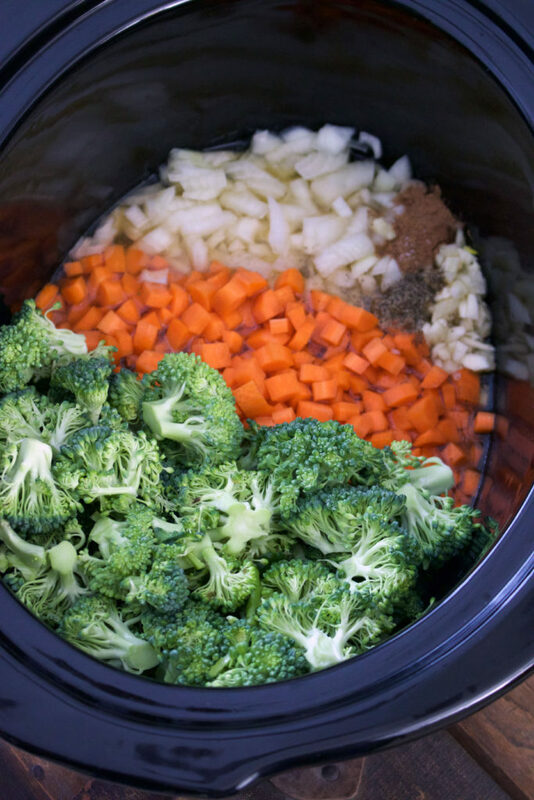 Set the crock pot to LOW and cook for 6-8 hours or HIGH for 3-4 hours. 3. Cream the soup. 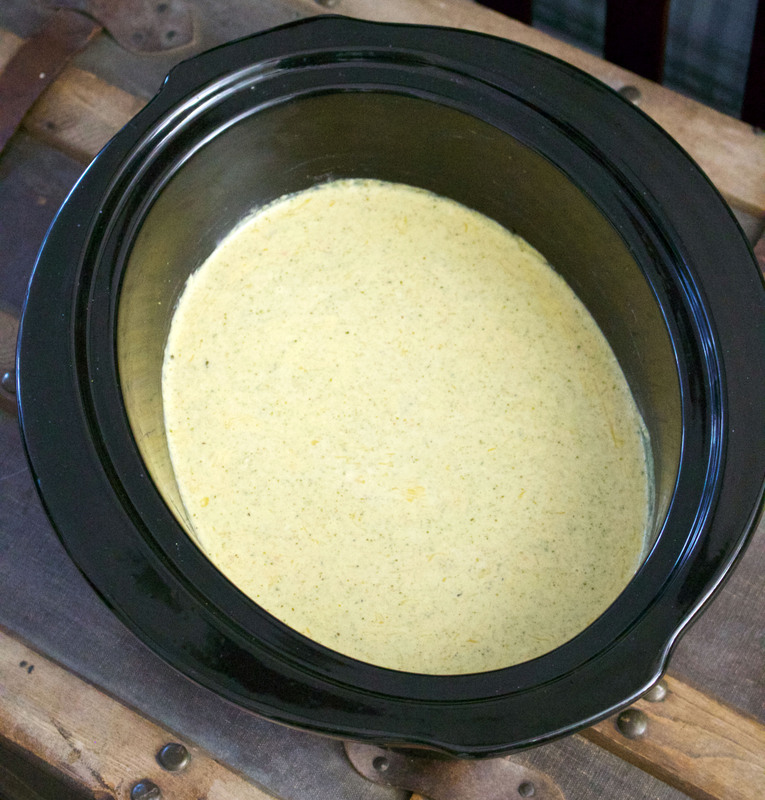 The easiest way is with an immersion blender but you can also transfer to a blender and then transfer back to the crock pot. If you prefer a more chunky soup, you can also use a potato masher so don’t let not having a blender or immersion blender stop you. You are dealing with hot liquids so be careful! 4. Immediately prior to serving, add the half-and-half and shredded cheese and stir. Allow the cheese to melt and garnish with extra cheese and serve. Yum! 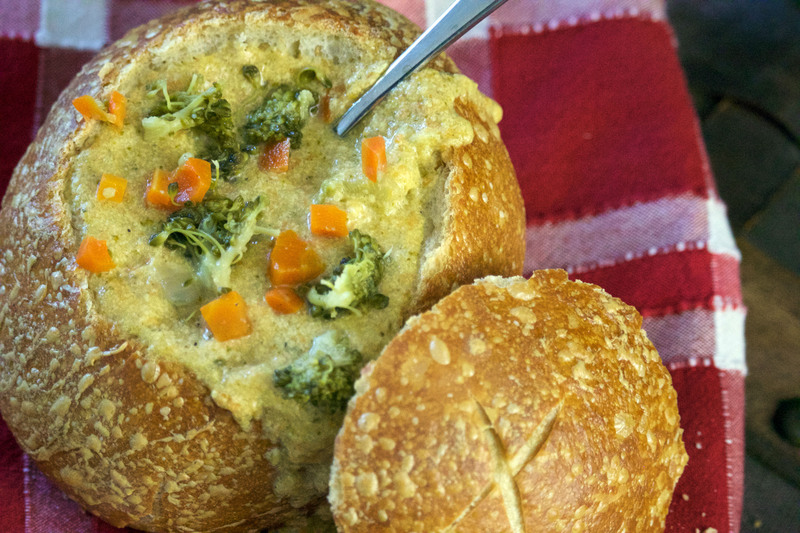 My family loves this recipe paired alongside my garlic knots or honey wheat crescent rolls or served inside a bread bowl. Looks like a good recipe for frosty fall days and winter around the corner. Looks delicious! Have you ever tried doubling the recipe in the crockpot? UPDATE: I doubled it last night and it turned out just as amazing as ever. It also disappeared just as quickly. Hi Jenny! 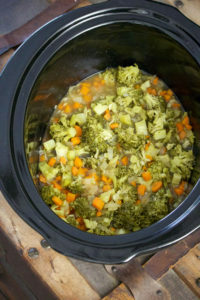 I’m a new crockpot user and this is the first recipe I’m going to try! Is there a way to do this without blending it? I don’t have an immersion blender or a regular one. Hope that helps–let me know what you try and how it works out! Making this tomorrow! Excited for it! Want to make this soup and freeze it in 6 one quart containers? Is this doable? Or will the half and half curdle ? I haven’t tried freezing it before but I do know that fat free half and half typically doesn’t freeze well on its own so it might be risky. 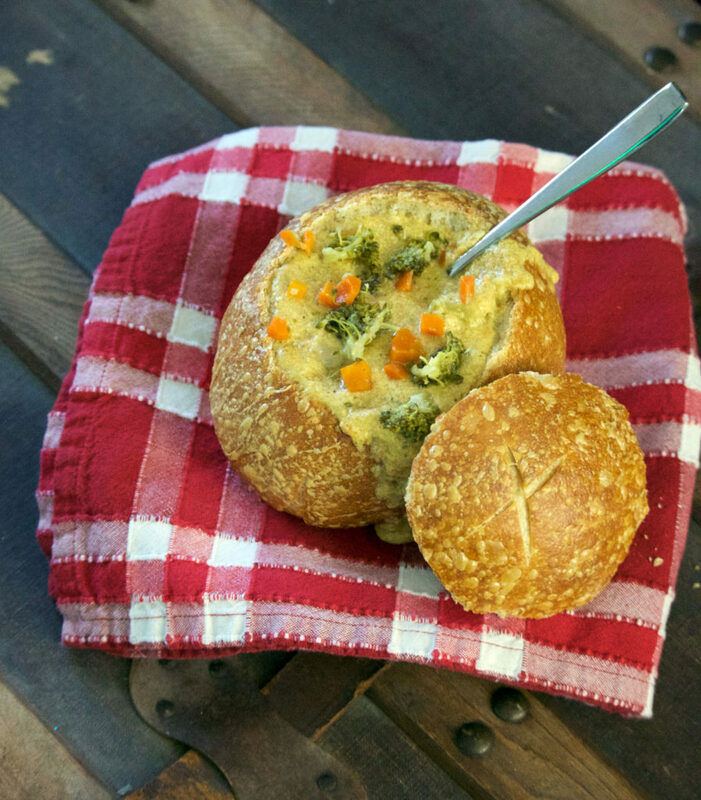 You might consider instead preparing the soup without the half and half and then adding it when you heat up the frozen soup. You could also try adding the half and half to just one of your containers to see what the verdict is so you don’t risk the entire batch. Let me know if you give it a try! Hope you enjoy! So if I plan to freeze the soup. . . I should use real half and half? Not fat free? Did like you said and froze it without the half and half. Thanks. I’m sure we’ll enjoy. I made this soup last night and it was delicious! Since I didn’t have a way to blend the veggies, I diced them up pretty small and the soup had a slightly chunky consistency which we prefer. Thanks for sharing your recipe!! Thanks so much for your feedback. So happy to hear you enjoyed it! Can I use whole milk instead? Absolutely! Since milk isn’t as creamy as half and half, I would recommend starting with one cup of milk and then add more. Just add it at the end as usual until you get your desired creaminess. Has anyone successfully frozen this soup either before or after cooking? Apologies on the delayed response! A few folks have commented with their plans to freeze and I did ask for verdicts but, unfortunately, haven’t heard any results. If you try freezing the recipe, please add a comment to let me know what you did and how it turned out. Happy cooking! Next time I will make it with mild cheddar. Found the sharp to be over powering. Thanks for the feedback, Heather! You can definitely mix it up to suit your cheese preference. Hope you enjoy! Can you use frozen broccoli florets instead of fresh? Hi Valerie, I haven’t tried it with frozen but I don’t see why not. What I would note is there might be a little more liquid so perhaps cut the stock in half and add it at the end if it still needs it. I also would recommend cutting the cooking time in half since you’ll be working with frozen broccoli florets, which are already cooked. Give it a whirl and please let me know how it turns out for you!